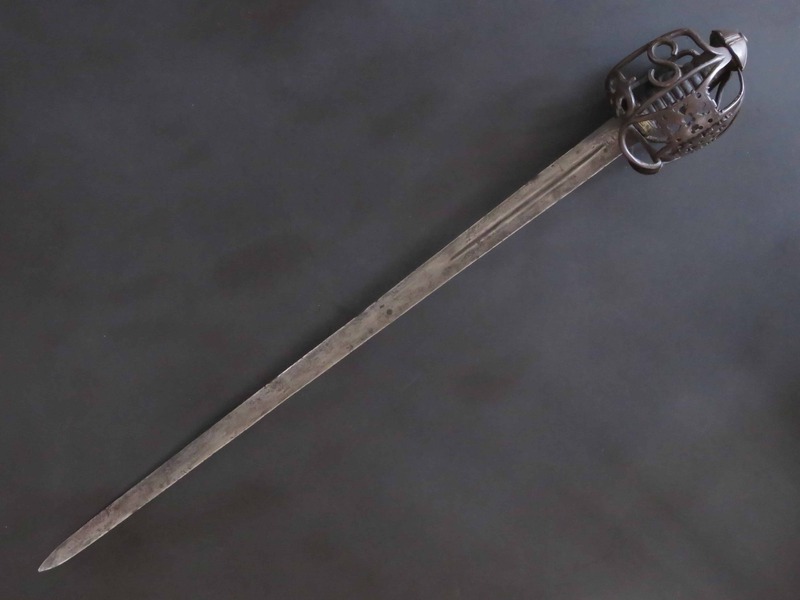 A handsome and fine quality Scottish basket hilted broad sword of “S” Bar form, of pleasing proportions, well balanced, and dating to the late 17th or early 18th century. 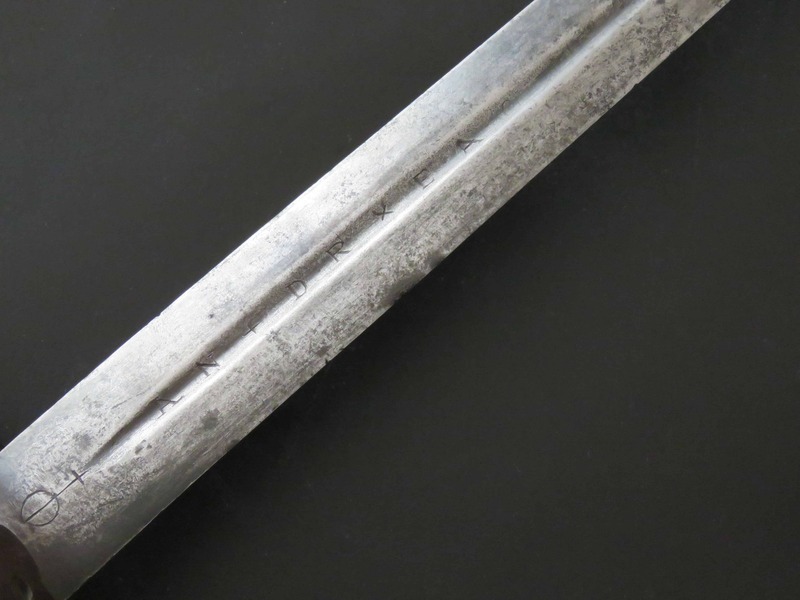 The sword has survived in original uncleaned condition with a deep and untouched dark burgundy coloured patina to the hilt. 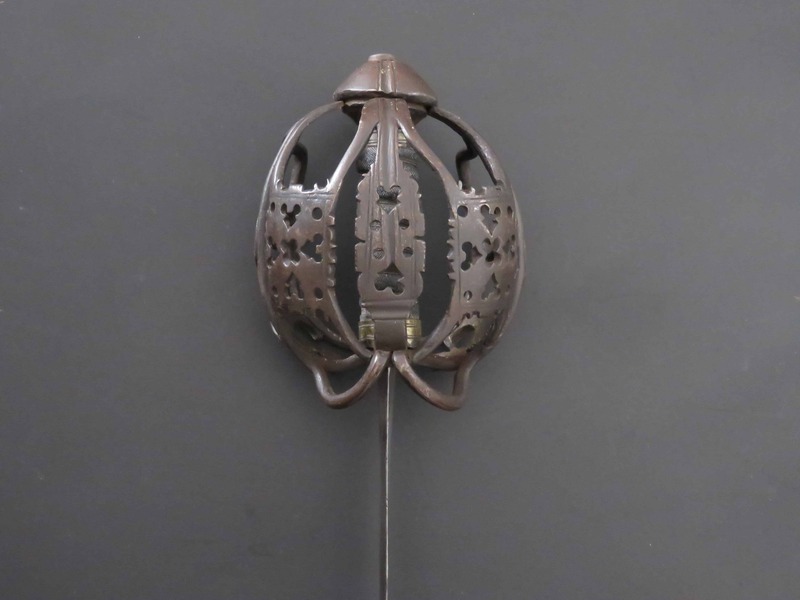 The attractive basket hilt is formed from well forged rounded bars mounted with two main frontal guard panels which are pierced with quatrefoils to the centres, surrounded by triangles and circles, and incised lines to the borders. 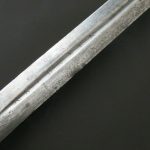 Between the main guard panels a secondary, smaller, frontal guard panel is mounted and decorated in a similar manner, and incised with decorative grooves and lines which extend up to the pommel. The edges of the three guard plates are finely decorated with fretted triangles and merlons. The side guards are formed with “S” shaped bars. The basket is of pleasing rounded proportions, symmetrical, undamaged, and well worked from thick metal parts. The pommel is cone-shaped with four sets of triple grooves radiating from the pommel button, the central groove being wider than those on its flanks in each instance, similar to the grooves filed into the upper part of the frontal guard bar. 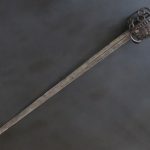 The three upper arms of the guard are securely tucked into a pronounced groove cut around the lower half of the pommel. The sword is tight and secure when in-hand. Early “S” Bar Scottish basket hilts are not excessively rare but they do not appear for sale often compared to other types. The “S” feature when present on 18th century fully developed Scottish baskets is probably a throw back to the preceding 17th century baskets of ribbon-hilted, and other early Scottish basket forms, which were manufactured with more rudimentary “S” bars in the hilts. Of tapering double-edged form the blade is of fine quality and probably of Solingen manufacture. 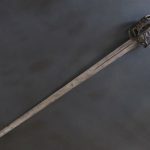 It has a single broad fuller either side extending from an inch (2.5 cm) below the hilt for circa 7.5 inches (19 cm) along the centre of the blade. The fuller is incised with “AN x DR x EA” on one side and “FE x RA x RA” on the other, plus an orb and cross mark which has been cut on both sides near the hilt. 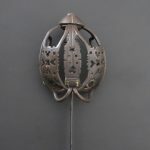 The grip is of spirally grooved wood, covered with shagreen, and secured with a brass wire binding and decorative brass ferrules top and bottom incised with line ornamentation. For an almost identical hilt see Cyril Mazansky, “British Basket-Hilted Swords”, The Boydell Press, 2005 fig E5c page 89 for a hilt signed by John Allan, Armourer in Stirling, now in the Marischal College Museum in Aberdeen in Scotland (this sword has had a wristguard added to the hilt in its later life whereas our sword is in original condition with the wristguard absent) . 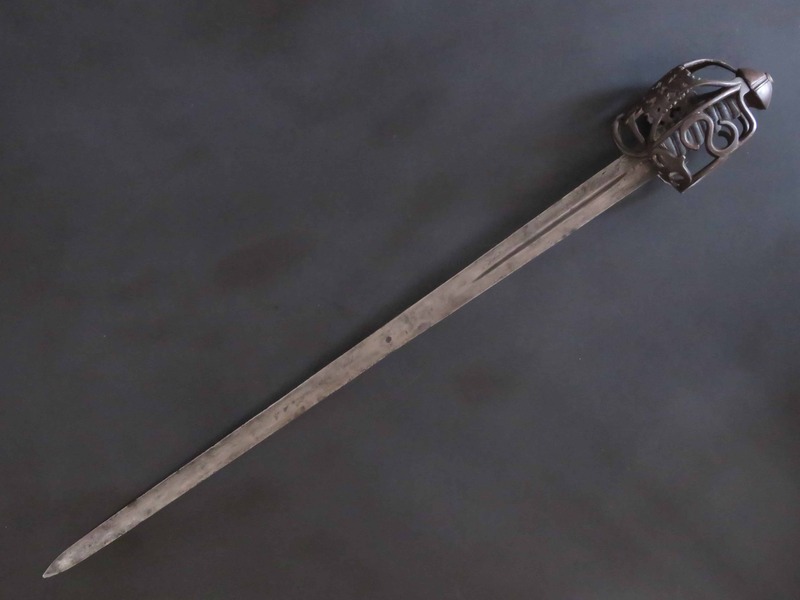 The blade length is 31 inches (79 cm) and overall the sword is 36.5 inches long (just under 93 cm).